At Plus Delta Consulting, we typically work with two different types of clients. Those that recognize an “even better if” exists for them and are ready to implement it to get to the next level, and those that are struggling to maintain their business just where they are today and need some help turning things around for a more sustainable future. Which are you? Plus Delta’s team of talented executive coaches and change management consultants work across all four critical areas of organizational performance – Strategy, Processes, Systems, and People. We design and deliver proven solutions that enable individual leaders, their teams, and even their broader organizations to produce better business results. How? By increasing organizational awareness and stakeholder engagement throughout the change effort, our clients become more involved in and therefore committed to these changes. At Plus Delta, we’re dedicated to making a difference with organizations that are making a difference. 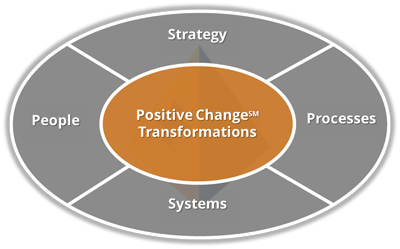 Whether it’s coaching the high-potential, next-generation leader of a small family business or managing the many facets of an enterprise-wide strategic change effort with a Fortune 500 corporation, we improve performance through Positive Change℠. We deliver on our Positive Change℠ promise by maintaining high standards of quality, respect, and collaboration in every project. The foundation of this approach is to work closely with our clients first to understand their specific business challenges and only then design and implement any required solutions. "We were really struggling before we engaged Jeremy to support our leadership transition. We weren't sure how our third-generation family business would continue after my retirement or if we might even have to sell the company all together. Jeremy really put us to task though, taking what seemed like a monumental effort and breaking it down into baby steps - with each easy-to-follow step simply building upon the next. We now have clear direction again, and not only has Jeremy very much met our needs but he has been an honest and compassionate consultant with the highest levels of integrity every step of the way!"